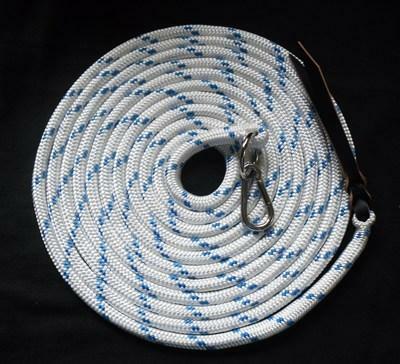 Made from 13mm diameter polyester doublebraid yachting rope. The perfect rope for training lines and used by top clinicians. The steel ring is spliced into the rope using a correctly constructed eye splice and the carabina snap hook clips onto the ring. Two other choices of fitment are available for this training line. Make your choice from the drop down menu. The English leather popper is attached to the rope by a backsplice to give additional weight at this point. Please note that the barrel swivel clips are panic clips and are designed to pop open under undue pressure, such as a horse standing on the rope and suddenly jerking upwards. This is why they are classed as panic clips. Unfortunately if this happens the clips are often un-repairable and I cannot offer an exchange or refund. The bull snaps are not panic snaps and so this will not happen.